The crosses symbolize the rail lines of the trains operated by the firm and the many directions in which trains travel. The keys and cups represent the hospitality at their hotels. The keys also symbolize the concept of unlocking exciting new adventures and travel experiences. The sharp peaks of the coronet refer to the Rockies and other mountain ranges which are one of the highlights seen from the Mountaineer trains and allude to the name of the trains. The osprey symbolizes the rich natural heritage of the region through which the trains pass and, being known for its acuity of sight, also refers to the foresight which is a hallmark of the company’s enterprise. The maple leaf identifies this as a Canadian corporation. The ram is already a widely recognized symbol of the Mountaineer and represents continuity with the operation’s history. It is also a distinctive part of the rich fauna of the region serviced by the trains. The collars symbolize the two types of service offered to visitors, the “gold leaf, red leaf” service on the Mountaineer. The badge refers to the “gold leaf, red leaf” service on the Mountaineer. 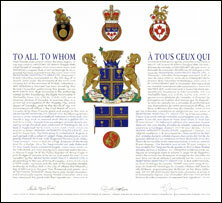 The announcement of the Letters Patent was made on October 6, 2007, in Volume 141, page 2825 of the Canada Gazette. Original concept of Robert D. Watt, Chief Herald of Canada, assisted by the heralds of the Canadian Heraldic Authority.